Effective Discharge Coefficient, Kd: Research, and Software, Ltd.
Units in Pressure Relief Valve Calculator: barrel=42 U.S. gallons, cm=centimeter, cP=centiPoise, cSt=centiStoke, ft=foot, g=gram, gal=U.S. gallon, hr=hour, kg=kilogram, kPa=kiloPascal, lb=pound, m=meter, min=minute, mm=millimeter, N=Newton, psf=pound per square foot, psi=pound per square inch, s=second, SSU=Saybolt universal seconds. Pressure Relief Valve Drawing (Spring) (with permission of Wikimedia Commons). Pressure relief valves are installed in nearly all refinery, chemical, and industrial facilities. Pressure relief valves are installed to protect equipment from failing due to over-pressurization. The calculation on this page is specifically for sizing and flow rate determination for rupture disks, spring pressure relief valves, and pilot operated pressure relief valves, or valves that have a rupture disk in combination with a spring or pilot operated relief valve for the flow of liquids. Balanced bellows valves can be spring or pilot operated and are specified where backpressure is expected. The equation methodology on this web page mostly follows the American Petroleum Institute standard 520 for pressure relief valve sizing for liquids in order to protect equipment having a maximum allowable working pressure of 15 psig (103 kPa gage) or greater (API, 2014, p. 1). For an orifice in a pipe (rather than in a relief valve), LMNO Engineering has written additional software based on ISO (International Organization for Standardization) methodologies. The calculations can be seen by clicking on the links in the yellow background on the right side of this page. LMNO Engineering's pressure relief valve for liquids calculator can compute relief valve area or flow rate. If area is computed, the area will be shown for the inputs that you enter. After viewing the area, refer to a pressure relief valve manufacturer's catalog and select a relief valve having the area computed or, if such a pressure relief valve is not available, the next larger area. Then, re-run our calculator using the manufacturer's actual area to compute the liquid flow rate through the pressure relief valve. The following methodology is used to compute relief valve area or flow rate. If there is a pressure relief valve with or without a rupture disk, enter Kd of 0.65. If there is only a rupture disk, enter Kd of 0.62. If there is a value provided by the valve manufacturer, enter the manufacturer's value for Kd. If there is no rupture disk with the pressure relief valve, enter Kc=1.0. If there is only a rupture disk (no relief valve), enter Kc=1.0. If there is a rupture disk and a pressure relief valve, enter Kc=0.9. If there is a value provided by the valve manufacturer, enter the manufacturer's value for Kc. For spring and pilot operated relief valves, Kw=1.0 (set by LMNO Engineering calculation by selecting "Spring and pilot operated valves"). If Pg < 16.5%, Kw=1.0. If 16.5% ≤ Pg ≤ 50%, the Kw equation is used. If Pg > 50%, Kw is not defined. If R < 32.662, Kv is not defined. If 32.662 ≤ R ≤ 192,282.5, the equation above for Kv is used. If R > 192,282.5, Kv=1. 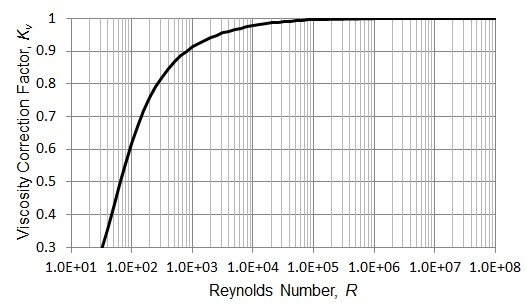 Since either area or flow rate is to be computed, Reynolds number is not known directly. Thus, an iterative solution is used which converges when the percent change in area or flow rate (whichever is being computed) is less than 10-10. Units shown in SI for use in equations: kg=kilogram, m=meter, N=Newton, s=second (the calculator allows a variety of units). A = Effective discharge area, m2. g = Acceleration due to gravity = 9.8066 m/s2. Kc = Combination correction factor. Kd = Effective discharge coefficient. Kv = Viscosity correction factor. Kw = Back pressure correction factor. 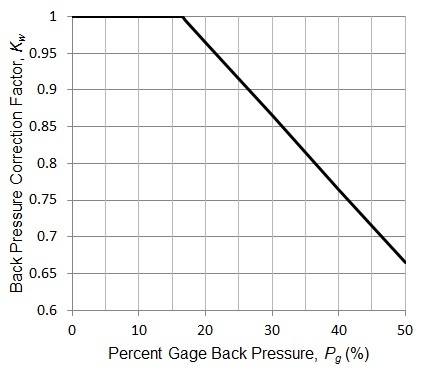 Pg = Percent gage backpressure, %. Po = Percent overpressure (gage), %. Ps = Set pressure, N/m2 gage. P1 = Upstream relieving pressure, N/m2 gage. P2 = Total backpressure, N/m2 gage. Q = Liquid flow rate, m3/s. μ = Dynamic viscosity, kg/m-s (i.e. N-s/m2). ρ = Mass density, kg/m3. LMNO Engineering uses the viscosity unit conversion from SSU to m2/s of 1 SSU = 2.2e-7 m2/s. However, if viscosity in SSU is less than 100 SSU, the relation between SSU and m2/s is significantly non-linear. Therefore, the unit conversion is not valid, and a different viscosity unit should be selected. Additional discussion of SSU can be found in Weast (1984, p. F-36). "Need A > 0", "Need D > 0", "Need Ps > 0", "Need P2 ≥ 0", "Need 1e-30 ≤ Q ≤ 1e30 m3/s", "Need 0 ≤ Po ≤ 100", "Need 1e-9 ≤ Density ≤ 1e9 kg/m3", "Need 1e-19 ≤ Viscosity ≤ 1e9 m2/s", "Need 0 < Kc ≤ 1", "Need 0 < Kd ≤ 1". "Invalid input: P1 will be ≤ P2", "Pg out of range", "R out of range: Q too small", "R out of range: A too small", "Solution not found". American Petroleum Institute. (2014, July). Sizing, selection, and installation of pressure-relieving devices in refineries. Part I - Sizing and selection. API Recommended Practice 520. 9ed. Crowl, D. A. & Louvar, J. F. (2011). Chemical process safety: Fundamentals with applications. 3ed. Prentice Hall. Munson, B. R., Young, D. F. & Okiishi, T. H. (1998). Fundamentals of fluid mechanics. 3ed. John Wiley & Sons, Inc.
Weast, R. C. (Ed.) (1984). Handbook of chemistry and physics (65ed.). Chemical Rubber Company (CRC), Inc.
© 2018 LMNO Engineering, Research, and Software, Ltd. All rights reserved.